DALLAS (AP) — DeAndre Jordan scored a career-high 25 points to match Blake Griffin, and the Los Angeles Clippers rallied to beat the Dallas Mavericks 119-112 Friday night after Chris Paul left with a shoulder injury. Jordan and Griffin combined for 10 points on a 16-2 game-closing run to wipe out a 110-103 deficit in the final 4 minutes. Jordan was 11 of 14 from the field and had 18 rebounds, while Griffin added 15 boards. Dirk Nowitzki was a game-time decision with a sprained left ankle but hit six of his first seven shots and had 14 points at halftime on his way to 24 for the Mavericks. Paul had 19 points at halftime before leaving with a sprained right shoulder midway through the third quarter. After Shawn Marion put the Mavericks up 110-103, Griffin had an alley-oop dunk on an assist from Jordan, and Jordan followed with a three-point play. Nowitzki broke a 110-all tie with a jumper, but Griffin sent the Clippers back in front for good on a three-point play. He was 11 of 13 on free throws. With the Clippers leading by two, Paul was tripped by Mavericks guard Monta Ellis while dribbling around a screen. He rolled over and stayed on the floor holding his shoulder while being attended to by trainers. Paul stayed down for about a minute before going to the locker room with 6:43 remaining in the third quarter. 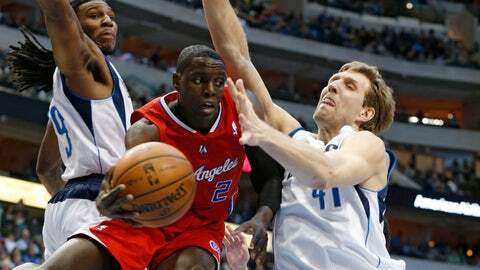 Darren Collison had a season-high 22 points and got most of Paul’s minutes in the fourth half in his first game against the Mavericks after spending one season in Dallas. Jamal Crawford had 15 for the Clippers, including a jumper that pulled them even at 110. The Mavericks had a season high for points in a half but led just 70-67 at halftime. Paul made his first five shots — all from 3-point range — before a miss from beyond the arc in the final seconds of the first half. Jordan had three of the Clippers’ five dunks in the first half, but Los Angeles kept giving up easy slams to a Dallas team that doesn’t make a habit of them. Shawn Marion had two of the Mavericks’ five first-half dunks. Jordan and Marion scored 11 apiece before halftime. NOTES: Marion passed the 17,000-point mark and joined Hakeem Olajuwon, Karl Malone and Kevin Garnett as the only players with at least 17,000 points, 9,000 rebounds, 1,500 steals and 1,000 blocks … Collison had five steals in the New Year’s Day win over Charlotte. It was his first five-steal game since Nov. 27, 2012, in his only season with Dallas … With their recent 3-0 trip, the Mavericks swept at least three games on the road for the first time since February 2011, their championship season. … Nowitzki scored in the first quarter for the first time in four games.